There are hundreds of private metal detecting websites, so this list is extremely selective. Born in Russia, Sergei is a detectorist living in the State New York, USA. On his website he describes searches in the US, in Eastern Europe, and in Russia. His stories combine solid and precise metal detecting knowledge with historical background information. Sergei's stories excel by narrative skill and carefully taken pictures capable of capturing the athmosphere of travels and searches in countries which are quite exotic to most of us. It shows how successful a site can become just because of content. In an internet full of gimmicks and flash effects that is very refreshing. Elena's stories have brief but well targeted texts that provide a lot of insight not only concerning the main topic also as far as the Russian society is concerned. The comprised pictures capture the essence of a place or situation. Her internet story on Chernobyl was accessed by millions of people. According to internet sources, she received offers to work for large news networks. She prefered to keep her status as independent investigative journalist. After the Chernobyl account Elena made at least two more projects, one a collection of short prison stories and the other named "The serpent's wall". Named after the local name of an ancient defense structure near Kiew, this story describes Elena's metal detecting activities at this spot. The story shows the same qualities that made her Chernobyl account so famous. Educated, good looking and with a passion for adventure and journalism. Most unfortunately, women like Elena are extremely rare in the male-dominated detecting scene. Actually, she seems to be unique. Sondengänger - the German word for 'metal detectorist' - is the German version of this website. German Language. Title translates to "detectorists (in) Germany". Unlike all other metal detecting websites I know, it does not describe the personal finds of the author but the reality of the metal detecting hobby in a specific country. Lots of inside knowledge. 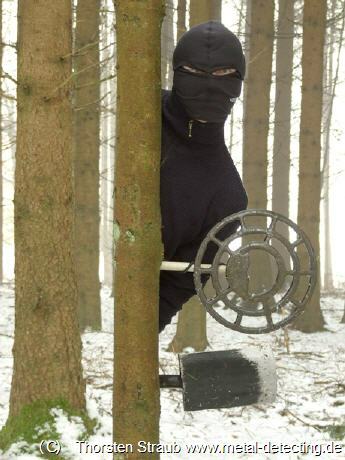 Describes metal detecting in Germany and the situation of the hobbyists. Law vs. real life, officlal archaeologists vs. detectorists, important role of private people with archaeological discoveries worldwide and in Germany etc.. Contains sources and annotations according to scientific standards and occasional ironical remarks. Voices the detectorist's viewpoint where usually only the state's archaeologists are heard. Does not avoid controversial topics. Very well received within the German metal detecting scene. At presence (June 2008) ranked #3 by Google for the German translation of "detectorist". Often the media depicts detectorists in a biased-negative way. Ironic picture used to illustrate an article on that topic. 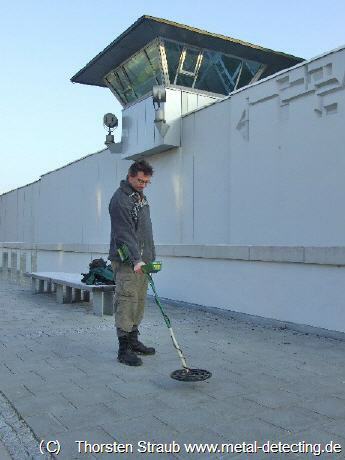 Author metal detecting the front yard of Munich prison. (C) Thorsten Straub www.metal-detecting.de 2006-2011.